Home → Nutrition → Can I eat pasta and still lose weight? Pasta is a comfort food for many. It’s also relatively inexpensive and a great source of carbohydrates if you are training as a runner. But many people hoping to lose weight consider pasta to be off limits. If you are a pasta lover but you want to lose weight, is it possible to have your pasta and eat it too? Yes, but here are some important guidelines to consider. If weight loss is your main goal then staying away from starches like pasta is a good first step. Eating lots of vegetables along with healthy portions of lean protein and fruit will help get your metabolism off to a great start. But let’s assume you’ve eaten lean and clean all week and you are now looking for some pasta indulgence. How can you do that and not undo the good work you did over the past week? Here’s how! 1. Pick a whole grain pasta. If you aren’t a fan, try Dreamfields Pasta. It looks and tastes like regular white pasta but its special recipe and added fiber has a lower glycemic impact on your system which means “you feel full longer to help maintain your healthy weight goals”. More and more companies are adjusting their recipes to add more fiber to their pasta. Keep checking labels until you find one that works for you. 2. Cook the pasta “al dente” to keep the pasta low glycemic. The more you cook pasta, the higher the glycemic index (GI) of the pasta. You want to keep the GI lower since this will affect your blood glucose levels and fat storage. So don’t overdo on the cooking! 3. If you’re using a sauce, use a tomato sauce that has no added sugar. If you are buying a sauce in a jar read the label and check the sugar content and make sure no sugar has been added. The lower the grams of sugar, the better. If you are making your own sauce, don’t add any sugar. Tomatoes already have enough natural sugar. 4. Serve your pasta with lots of added steamed or raw vegetables. The added veggies will add fiber to your meal which will keep you full and will add lots of great nutrients. The veggies will also bring down the glycemic load of the pasta. All that means is that it will reduce the impact the pasta has on your fat storage and blood glucose levels. All good! For even more impact have a salad before the pasta. This too will bring down the glycemic load! 4. Now add lean protein. Skip the hamburger or sausage and if you are tired of chicken, why not use fish?! For example, White Cod is very lean and low glycemic, high in protein and added nutrients and a healthy alternative to complement your pasta dish. By adding lots of fiber and lean protein to your pasta you’ll be able to resist the temptation to have seconds and you’ll be able to enjoy pasta even though you’re on a weight loss mission. Here is a recipe I’ve adapted to give you an idea on how to go about incorporating healthy options into your pasta dish. Arrange the fillets in a 13″X 9″ baking dish. Drizzle with the lemon juice and oil, and sprinkle with the garlic, thyme, salt, and pepper. Sprinkle with the paprika (if using), and lightly rub it in. Bake until the flesh is completely opaque but still juicy, 15 to 20 minutes. Set aside with pan juices. Cook pasta “al dente” according to package directions. Steam vegetables like brocoli and cauliflower. 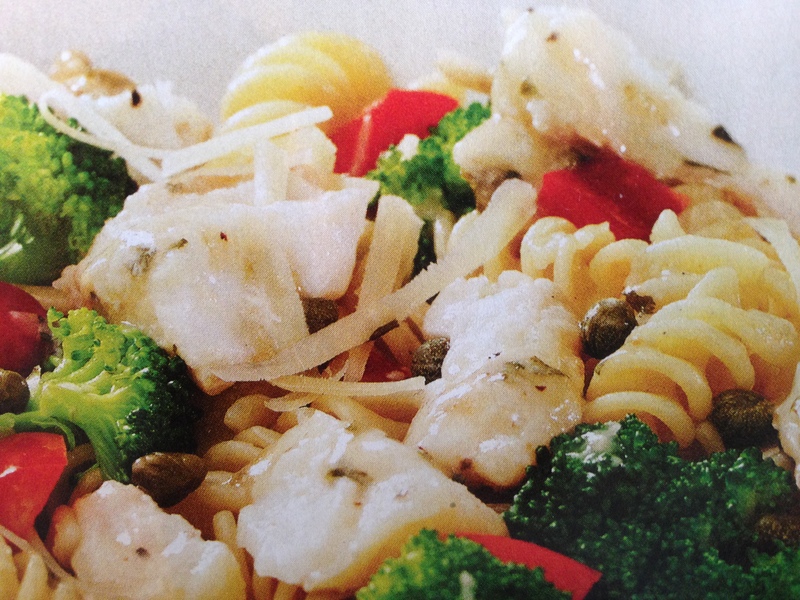 Once the pasta and veggies are cooked combine in a large bowl with the red pepper and capers. Heat Olive Oil in a large skillet and add pasta mix and saute for a few minutes to blend flavors. Season with salt and pepper and cheese. Flake fish over the pasta and pour over the pan juices. This is just one example on how to bring down the glycemic load of pasta if weight loss is your goal. If you are mindful of portion control and accompany the pasta with lean protein and lots of fiber there is no reason why you can’t come up with your own variations and still manage to stay on track.